On March 17, 2018, Jerome Corsi, Charles Ortel and the host of a program called Grand Torino did an interview about the Clinton Foundation scams in Ireland. While they were following the money, behind every dollar and every word, there were connection to the global health extortion racket. 1990 was the kick-off year for the New World Order but there were a lot of preparations prior to 1990 obviously. The New World Order is the end of the nation-state replaced with a global technocratic system of management enabled by the integrated global telecommunications system (i.e. Internet) as the central nervous system – the corporate backbone as it were. Global health is a high tech system of telemedicine, just-in-time supply chain, electronic medical records to allow medical research, experimentation using personalized medications (every patient is a potential lab rat), differential pricing, computer-aided prescribing, robotics and more. It’s state of the art technology that requires an equally high tech infrastructure – clean water, reliable electricity, good transportation systems and most importantly a good telecommunications system with high speed internet capable of transmitting high volumes of high resolution images and video. It requires highly trained people both in the medical field and in the IT sector to install and maintain the systems. The people who develop the technology and the people who write the software and maintain it are among the most highly paid people in world along with people in the medical field. What has happened with the simple idea of providing health care to people in the lesser developed countries is that world leaders have mandated that the most costly sectors of the developed world’s economy will install their high cost systems under a charity model behind the curtain of economic development using the threat of biological warfare as an “incentive“. Tiered, or differential, pricing permits developing countries to receive favorable prices, but it requires that the global public sector support appropriate market segmentation and that commercial firms receive a reasonable return on their investment in industrialized countries. In the white paper, the author talks about a reliable stream of money flowing to this chemical Manhattan project. Using the collective national systems developed for health care, it’s not difficult to see how a global health tax could be applied to the cost of health care for American consumers. We pay the highest price in the world for drugs. Are we subsidizing the world for drugs? I’d say yes. The U.S. doesn’t even provide health care for it’s own people – and yet it is providing massive funding through a myriad of funding streams to build a global chemistry-based infrastructure for application on human populations. The massive funding is distributed among many budget categories including the military so when Congress is asked about how much money we are providing for foreign aid, they can say truthfully, a very small amount. But if one digs deeper into other categories of spending like programs at the universities and hospitals, they will find huge pots of money being spent but not for the benefit of the American people. In the story told by Charles Ortel, Bill Clinton and his family are just celebrity crooks stealing money but what the exposure of Clinton’s criminality did do was to pull back the curtain enough to see the bigger corruption – the Global Manhattan Project 2.0 – Chemical Warfare. Governments around the world have been corrupted with the idea of building global governing systems – the health system being only one of them. As the Ranbaxy Pharmaceutical company’s corruption shows, the real crimes won’t be about money. The real crimes will be crimes against humanity – the most heinous of all crimes a government and its people can commit. 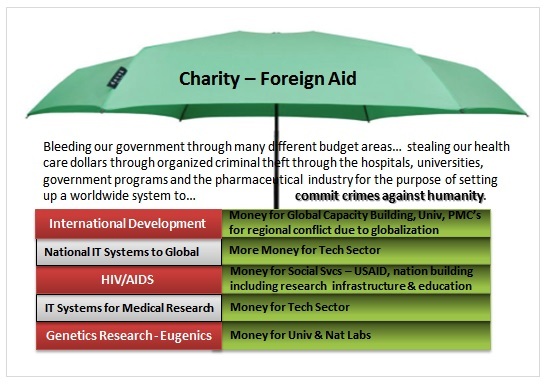 There are several layers to cut through to discover the true nature of what is going on in terms of “charity fraud” because it isn’t just NGOs and it isn’t just charity fraud. It’s a worldwide conspiracy of treason and chemical warfare executed by the largest multinational corporations, the Foundations, medical institutions and the United Nations. As someone called it recently, the Medical Industrial Complex. Human Genome Project – A Cover Story for AIDS Research? The Human Genome Project (HGP) was initiated by the Department of Energy. “The DOE considered the initiative part of its ongoing work in molecular biology largely focused on mutations and other biological effects…”. The Timeline for the HGP is found on the Oak Ridge National Laboratory website. In 1988 the DOE signed an MOU with the NIH to develop the research infrastructure for the study of the human genome – mapping the DNA. The research infrastructure included computers and telecommunications network between government, university and private sector medical research facilities, etc. You can read more about that HERE. 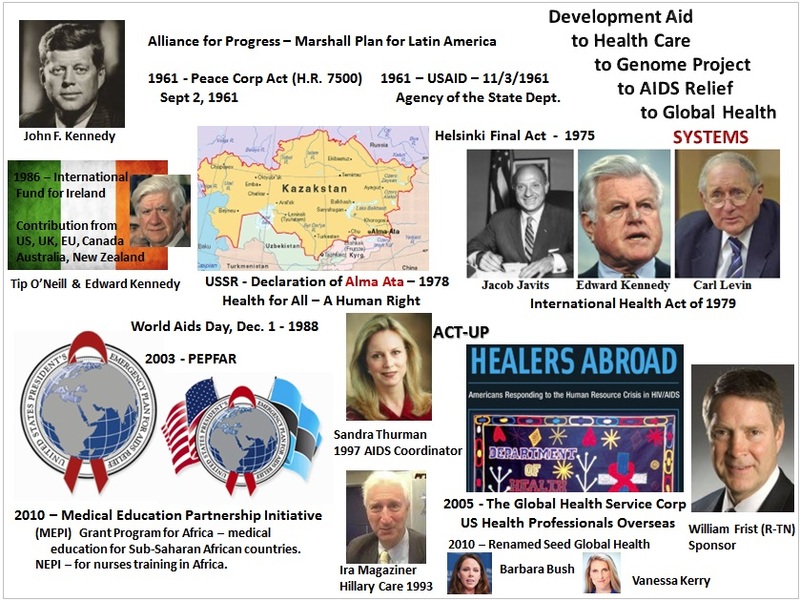 Having started down this research path because of Charles Ortel’s work on the Clinton Global Health Initiative, it makes me think that the Human Genome Project – mapping the genes was a cover story to enable massive spending on AIDS research and the building of the global medical system. (Note: I said medical because it’s not about health regardless of the impetus for initiation). In order to integrate the new information provided by Charles Ortel into the information that I have on the Human Genome Project and the re-engineering of our health care system related to Global Health and terrorism, I had to split up their interview into several separate topic areas. Over the next several days, I’ll be posting the pieces to this puzzle. In the meantime, take a look at this montage because these are just a few of the elements of the story and it gives you an idea of the timeline. VICKY this is too much information- VALUABLE and fascinating information- in one place. You gotta break this up into manageable chunks for American consumption. Remember, our cognitive skills have been carefully minimized, our ability to select and absorb information is dulled, and our attention spans mimic those of a gnat. The RANBAXY fraud – and the Clinton’s connected to that company, is a story in itself. What I’m saying is, you wrote this for someone with your brain. Most of us Americans don’t have your brain. They can only focus in on one topic at a time. I am going to share this piece, and I hope to God it gets read and shared ad infinitum on the social networks. It needs to be seen. As far as I am concerned, you are more useful and valuable than Mark Levin, who now has his own TV channel that millions of people subscribe to at 10$ a month fee. You are correct about the Brain Science end of the spectrum, Kristin; just look at how may “for dummies” books have proliferated like jackrabbits over the last 30 or whatever years. The other the end of the spectrum from the Brain Science side is the Meta-Psychology side (mainline psychology as taught in English-Speaking Universities as a sub-set of sociology and not of philosophy is a whole different rabbit hole that I could probably write a book on if I had the time and money). Other’s might differ, but I define meta-psychology as something that we experience, all the time, and at the end of the day, after being on the consumption end of media all day in a media world of our own making, as opposed to the being part of the creative/imaginative end, we find our identities by “where have been” metaphorically and historically. These vital issues, that need to be shared with those “who are waking” or have become individually strong enough, and aware enough to test all of the truth claims extant, as the context for all media and the way they invest their money and time on print, film, radio, TV etc. relating to this “reality” someone has labeled “meta-psychology. Sounds new agey, doesn’t it? Beware the for-profit tube. Beware of bad habits. And for goodness sake accept the fact that sin is real and is made manifest spiritually in the material realm. Vicky is writing from her experiences as a systems analyst, I would think (? )…her mind is wired to see things dynamically and systematically within man-made-systems: and reads and writes in a particular brain-state that I would call Deep Reading; quickly and efficiently. (A little psycho analysis, sorry, Vicki, but that’s true). She is motivated and has developed a good bit of skill by building and maintaining her website, as well. It is not rocket science, but I should be talking. She actually needs to be involved as an instructor in a Educational System that only exists in our minds at this time, get it, spiritually. Sounds scary bones, but that’s the truth. May I please suggest you get a copy of Jacques Elul’s “The Technological Society” from the 1960’s, and spend as long as you need to (a year?) to go through it completely, and come to your own conclusions. You seem to be on the right track. God Bless You. That’s a very interesting comment you’ve written John. I’ve often thought as I was doing research – veering off on some thread not directly connected to my purpose but interesting history just the same, that there is no such thing as a single history. History is in and through the eyes and interests of the person doing the research. What they find will depend on where their interest takes them. I’m on shaky ground here because I haven’t spent a lot of time on it, but I think the ideas behind the Articles of Confederation were drawn from the system of ownership – the landed gentry of England. When the Articles were replaced by the Constitution, I think the founders tried to create a system based on philosophy without a monarch. The Constitution provided the framework for that type of government. Someone interested in philosophy would have a far different view of history than the one that I’m working on. I’m not unmindful of philosophy. It’s just that the discussion of what was intended and what should be relative to what is are not relevant to my purpose. That doesn’t diminish the value of that view of history anymore than it elevates mine. It’s just different. And I should have added that they’ve actually changed our form of government through the design engineering of these technocratic systems.